SOUTH CAROLINA, USA, Oct 16 (IPS) - George C. Greene, IV is the President and Chief Operating Officer of Water Mission*, a nonprofit Christian engineering organization that designs, builds, and implements safe water, sanitation, and hygiene (WASH) solutions for people in developing countries and disaster areasOn Friday, September 28, the world first heard the devastating news out of Indonesia that a 7.5 magnitude earthquake had struck the island of Sulawesi. The quake caused substantial soil liquefaction — where the earth literally turned to liquid and started to flow — with entire homes sinking into the ground. It also triggered a tsunami, confirmed to be as high as 23 feet, that devastated the coastal areas. The photos coming out of the impacted region are mind-numbing and include images of cars wrapped around poles and ships that were washed inland sitting on dry land. The stories are heartbreaking and range from reports of children away from their parents at camp being found dead to an older man who is now the only one left alive in his family of 14 people. When a disaster strikes, safe water is usually the number one need. Water Mission mobilizes personnel and water treatment equipment to provide aid to affected people as quickly as possible. We build and preposition Living Water Treatment Systems — our patented, mobile treatment systems that utilize rapid sand filtration and chlorination. Once onsite, one system can be set up and functional in two to four hours, providing enough safe water for up to 5,000 people daily. In Indonesia, we were fortunate to already have an established presence, dating back to 2005, with offices on the islands of Sumatra and West Timor. With twenty staff members and ten Living Water Treatment Systems prepositioned in the country, we have been able to respond quickly and work with our indigenous team to reach the communities most in need. Aware of the logistical unknowns related to moving our equipment from Sumatra and West Timor to the impacted island of Sulawesi, we also airfreighted equipment from our headquarters in North Charleston, South Carolina, to enable a diversified approach to delivering aid as fast as possible. We are fortunate to have a unique relationship with FedEx, one of our corporate partners and sponsors, and they expedited a shipment of two additional Living Water Treatment Systems and approximately 1.1 million P&G Purifier of Water packets. The P&G Purifier of Water packets will provide 11 million liters of clean water, enough to sustain approximately 75,000 people with 20 liters a day for one week. Each Living Water Treatment System can provide enough safe water for an entire community. The majority of this work is being made possible by another corporate partner and sponsor, the Poul due Jensen Foundation, who offered a significant grant that is allowing us to provide safe water to more than 75,000 people in and around Palu — a large city on Sulawesi that was devastated by the disaster. The death toll is now more than 2,000 people, and it is estimated that more than 5,000 people are still missing. Conditions are horrendous, and we feel compelled to raise awareness because the need for basic access to safe water and sanitation is critical for the survival of people in the impacted region. Our goal is to meet this need and help bring stability to a tenuous situation — people are hanging on by a thread while simultaneously trying to process what happened and grieve the loss of loved ones. 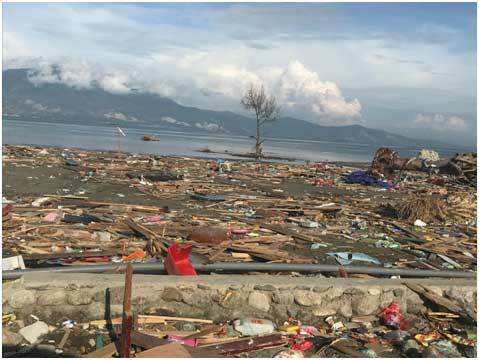 Logistics remain challenging as the Palu airport was severely damaged. Our Indonesian team is making the journey to Palu from all across the country, and we are working to bring clean water as quickly as possible while building relationships with the government and local communities in need. Our team in Indonesia is experienced and equipped with water, sanitation, and hygiene (WASH) best practices and sustainability methods. Having completed more than 150 safe water projects in Indonesia, serving more than 340,000 people, our indigenous staff will not only respond immediately, they will stay and work to help local communities rebuild with the goal of providing long-term access to safe water. In the coming days, having access to safe water is imperative to ward off the threat of disease and continued loss of life. Unfortunately, more than 2.1 billion people around the world lack access to safe water and more than 4.4 billion lack access to adequate sanitation. This is not a problem for any organization to face alone. Rather, through continued collaboration, we believe humanitarians, nonprofits, governments, and communities can come together and forge an alliance to address one of the world's most basic needs: water. Our hope is that, even after this disaster vanishes from the headlines, people will not forget but will unite and advocate to change the harrowing statistics. Every day, 2,300 people die from waterborne illnesses directly tied to a lack of access to safe water and compromised sanitation hygiene and each one of these deaths is preventable. In disasters, conditions are infinitely worse, compelling us to respond as quickly as possible. We know that people need safe water to live, and we are working diligently on multiple fronts to address this need in Indonesia. As we continue to respond, working with local communities to provide clean water to impacted people in the region, we are asking for your support. First, to raise awareness about the global water crisis. Second, to join us in prayer for all the families who are mourning loved ones and facing the daunting task of rebuilding. And finally, to partner with us in our efforts. Everyone has the ability to create change, and I encourage people to think about what they have to offer in four different areas: time, talent, treasure, and influence. It can be overwhelming to read the reports and hear the staggering news that more than 2.4 million people have been impacted by this earthquake and tsunami. But by joining us in our efforts, you can help restore dignity and bring hope to the survivors. It is encouraging to collaborate with the Poul due Jensen Foundation, the FedEx Cares Delivering for Good Initiative, and P&G, demonstrating our common bond and commitment to helping others when disaster strikes. When we work together and empower each other, we can make a bigger impact and tackle overwhelming problems like the global water crisis. Our Indonesian team will continue to respond, and we are ready to deploy more resources as needed. If you are interested in updates on our relief efforts in the Palu region, you can follow online at watermission.org. *Since 2001, Water Mission has used innovative technology and engineering expertise to provide access to safe water for nearly 4 million people in 55 countries. Note: All photos can be attributed to Water Mission.